Last week I was sitting in a cafe working and at the table next to me were three tween girls. Two were 12 and one, a little sister, was 10. One of the 12-year-olds had a smartphone. We chatted a bit and soon I was sitting with them at their table as we discussed lots of things about social media. I asked the other 12-year-old if she had a smartphone and she said yes but her mom had taken it away for the time being. She soon confessed to me that she had lots of workarounds without her phone, such as using SnapChat and Instagram on her iPad. This got me thinking that it was time to get clear about what can be used on what devices and to share with you today. Establishing clear rules around screen time is, of course, the first step. Yet managing the limits often zaps our energy and results in power struggles, arguments, and grumpy kids. Another problem is that while the kids may have put their phones away or turned off the Xbox, they can turn on their tablet, Chromebook or MacBook to do “homework” and continue using social media apps and games. 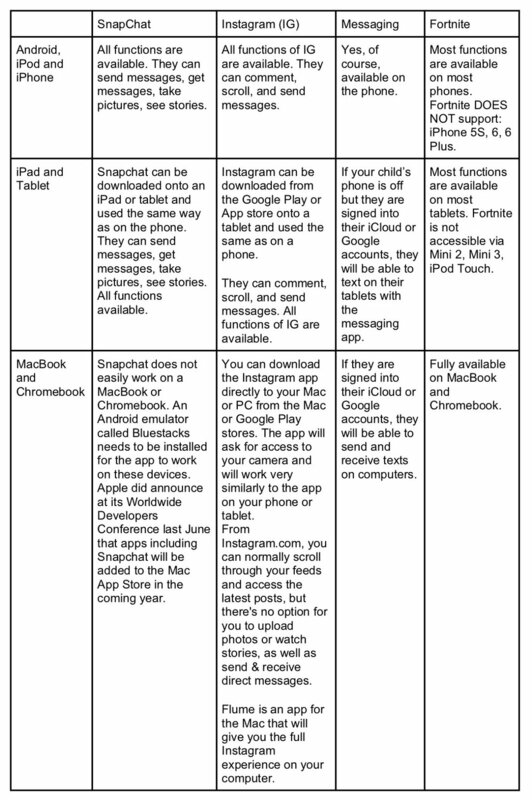 I have broken down what popular apps and games work on which devices, so you can be better prepared to stop workarounds. And… be sure to look at our resource page on apps that help you manage screen time at https://www.screenagersmovie.com/parenting-apps/ .